What’s so special about the air up there? Well, it’s the fact that it is ‘up there’. Duck Mountain Provincial Park in the province’s Parkland region is home to the highest point in all of Manitoba. Baldy Mountain is 831 metres above sea level, a geological remnant of the last ice age. We purposely took the scenic route through Riding Mountain National Park and continued north up highway 366 in order to drive up Baldy Mountain, reaching the scenic lookout tower. Looking out over a tall forest of spruce and aspen, we could easily get a sense of our elevation over the landscape below. The elevation once again became apparent as we left the park, this time thanks to the expansive vista of the Swan Valley north of the park, as we drove through the town of Minitonas before heading back southeast toward our home in Winnipeg. The Duck Mountain Forest Centre just inside the northern limit of the park houses an impressive elevation model of the area that really gives you a sense of the peaks and valleys of the Parkland region. Like much of the Parkland region, lakes are plentiful in the Ducks. One of the park’s most impressive lakes is East Blue Lake, a spring-fed lake with lovely and unexpected turquoise water. 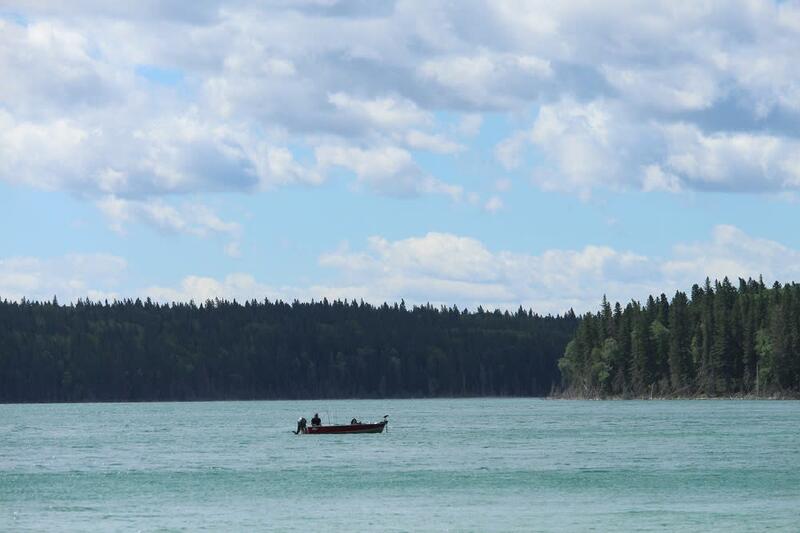 The lake is 60 metres deep and is one of Manitoba’s clearest lakes. Boat rentals are available if you don’t have your own. But, as we discovered, even the view of the lake from beach or the lakeside playground is spectacular. We were also treated to amazing lake views from the private dock of our cabin at Wellman Lake. Boat, canoe, kayak and pedal boat rentals are also available at from Wellman Lake Lodge. We watched as some ambitious visitors enjoyed a pedal boat excursion on a particularly windy day. The park also offers a couple of easy canoeing routes, with some short portages and backcountry campsites. When the family staying in the cabin next to us told us they caught some perch on nearby Two Mile Lake, we packed our rods to see if we would have the same luck. Our six year-old was convinced he had many nibbles, but we didn’t have any success reeling in a Master Angler. But, we did see several boats out on the water, certainly having success catching walleye, pike, bass, lake trout and rainbow trout. And even though we didn’t catch our own fish, we did get up close to Manitoba’s fish species thanks to the display at the Duck Mountain Forest Centre. While the water might steal the show, the steady performer of the park is its beautiful forests, which we explored on two different hikes. As we made our way along the peninsula jutting out into West Blue Lake on the Shining Stone Self-Guiding Trail, we could see some of the different vegetation of the park, including white spruce and jack pine, dogwood and snowberry as well as alder and birch. The towering forest surrounded us as we made our way along the Copernicus Hill Hiking Trail. At the top of the hill we found a viewing tower with a picnic table, a perfect place to enjoy the view and stop for a snack to restore our energy before heading back down. We stopped to read at the plaques honouring the trail’s namesake, Nicolaus Copernicus, whose ground-breaking work placed the sun at the centre of the universe. It was a nice teaching moment and spurned some interesting conversation as the kids scrambled back down the trail. 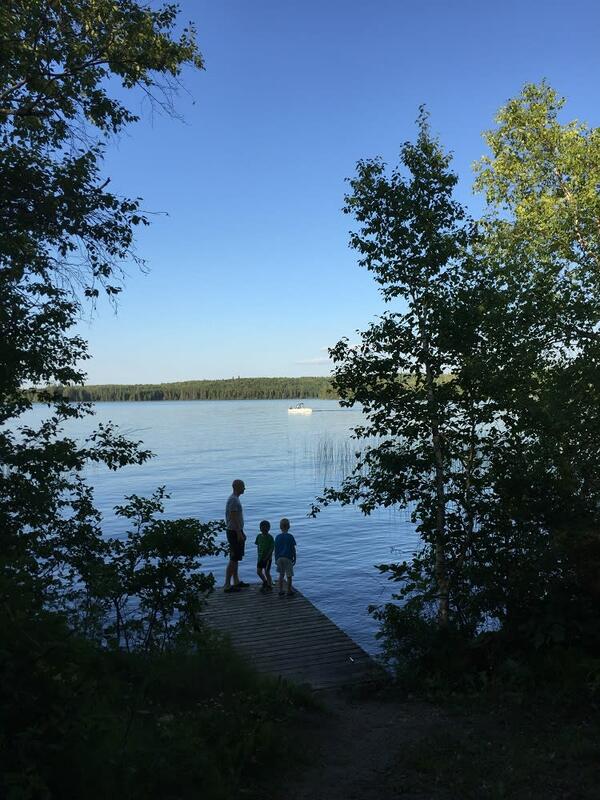 Our lakefront cabin at Wellman Lake was spacious and comfortable and we enjoyed sunlit breakfasts overlooking the lake and evening fires roasting hot dogs and making s’mores, thanks to the ample firewood provided. We even enjoyed a tasty pizza at the lodge just up the road. Wellman Lake Lodge also stocks a variety of groceries, gifts and most importantly – ice cream! A giant bouncy slide next to the lodge kept the kids busy for hours and at $2 per kid, it was certainly worth the money. The playground at Wellman Lake, just off the beach and across from the campground, also offered loads of fun. Blue Lakes and Childs Lake also offer the same type of amenities found at Wellman Lake and there are additional boat launches found throughout the park. So with my memories of the Duck refreshed, I have a new appreciation for this special park, to which I hope we will return again some day. Travel Manitoba staff was hosted by partner Parkland Tourism Association, who did not review of approve this story.